Exploring wrecks has been a passion of mine for many years and together with a team of like-minded Blueflash divers, our ongoing search for little known or totally undiscovered wrecks was recently rewarded! After a dry spell of almost a year, we found the Matapan! A spark was ignited about 10 years ago when I noticed a wreck on the Table Bay navigation chart 1 nautical mile off Mouille Point. Further investigation at the navy Hydrographic Office revealed little more than it’s name: “Matapan 1960”. I went for a dive on the charted co-ordinates but found nothing. This was not surprising as charted wreck positions are notoriously inaccurate! The next step was to pull a magnetometer over the area as this is by far the easiest way to find wrecks. My friend Jean Tresfon has a mag but when he tried the area he found the magnetic anomalies in the rocks made magnetic wreck searches impossible. We did a few other mag searches further into the Bay with more success, but the Matapan eluded us. At the start of the Atlantic diving season last year, I decided to try again. If we couldn’t find the Matapan with a mag then a grid search or a towed diver search would have to do. For towed diver searches we use a wooden board or sled with the tow line attached to the boat. At full speed (about 3 knots) the diver needs to be secured to the board as the drag force is very strong and one can only hold on for a few seconds. A quick release clip can be activated if anything goes wrong or if wreckage is seen. The diver’s DV (demand valve) also needs to be covered to prevent it free-flowing. It takes quite a lot of practice and constant adjustments to get it working efficiently. In the past we had only used it in shallow water and we soon discovered that getting it deeper than about 15m was a problem because the long tow rope had too much friction with the water so it just pulled up to the surface. With me as skipper and Peter Southwood and Mauro Introna as shark bait sled divers we worked out that we needed a very thin cord as the tow line and with a bit of extra streamlining of the rigging and dive gear we could get it down to 25m. We were ready for the Matapan search. I contacted I&J to see if they had any info on her they just requested us to submit a written request for info from their archives. I wrote the request but nothing came of it at the time. In search of more detailed information I got my friend Anton Borruso to spend a few hours at the Cape Town archives. He found newspaper articles, 2 from the Cape Argus and 1 from the Cape Times, reporting the sinking. The articles confirmed the internet text. There were also graphic personal accounts of the collision and sinking. Unfortunately there were no clues to indicate a more accurate position for her. With the resultant huge search area of well over a square mile I realized that it might take many diving days to find her. But being the first to find a wreck is worth it so we decided to go for it. On the 31st October 2010 we set off for our first search dives. The sea was dead-flat with no wind and the viz was about 15m – perfect conditions. We started with 4 buddy pairs of divers swimming in straight lines from set points. The idea was to get a good idea of the depth of the whole area as well as the nature of the sea-bed. The divers found the depth to be from 26m to 24m with a low rocky bottom. That gave me confidence that a sled search might be the way to go because had the bottom had rocks standing up over about a meter it would be difficult for a towed diver to discern between wreckage and rocks. The flat nature of the bottom in the area improved our chances of success significantly. We deployed the sled with Peter Southwood the first to go for a ride. After less than 5 minutes Peter detached from the sled and put up his surface marker buoy (SMB). We figured there had to be some problem so we recovered the sled and waited for him to surface. As soon as his head popped out he shouted to us if we had got the position of his SMB? He had found some scattered wreckage but we hadn’t taken the position immediately and by then he had drifted well away. All we could do is estimate the direction he had drifted and where that line would cross the towed path of the sled. I put a shot line down in that position and 3 divers went in to see if they could refine the position. Unfortunately they were all the same divers who had just completed the first search dives and they didn’t have much bottom time left at 25m, even with nitrox. They did manage to find wreckage and get a better position but it was nothing that would indicate we had found the Matapan. We would have to come back another day. At that time the I&J archives guy let me know that he had found a photo negative of the Matapan but nothing else. There was no report on her sinking or any record of her being salvaged. I had the photo developed and for the first time saw the ship we were looking for. A piece of Cape Town’s all but forgotten history. A week later we were back at the search site. This time there was a 30 knot south-easter blowing over the area and an exceptionally choppy sea. Six divers dropped in to find the viz was once again excellent. Within a few minutes they had marked the position of a huge boiler and as they came up with descriptions of what they saw it became clear that this was the wreckage of a significant vessel. After that dive we were able to compare features of the vessel from the I&J photo with photos taken by the divers. I was sure it was the Matapan but why was she so broken up? The answer to that question was revealed on the next dive when we found her propeller boss with the propeller blades missing. She had been salvaged with explosives. 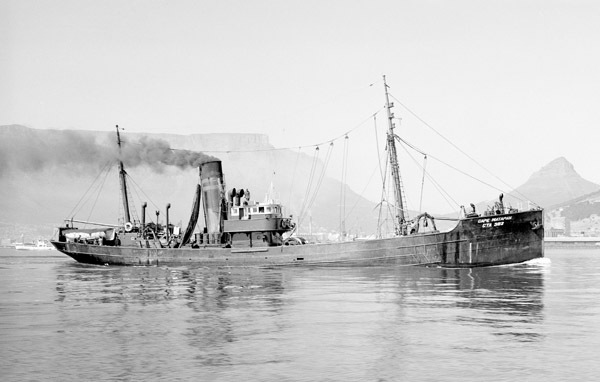 The use of explosives, together with her old age had resulted in the wreck being reduced to a scattered pile of debris with only her large Scotch boiler remaining intact. Her bell was also missing which was quite a disappointment. Unfortunately she had gone the way of just about all the Cape wrecks – unable to survive the pounding of our winter storms or the hasty efforts of our early salvers to remove bronze propellers. We have dived the Matapan a few times after that and the site has now been accurately mapped by Peter Southwood. 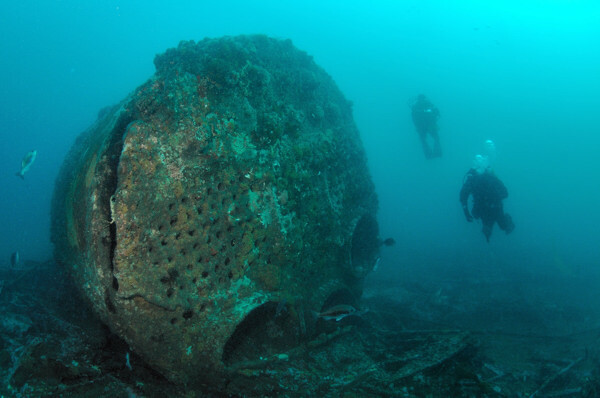 It’s a great dive for anyone interested in Cape wreck diving with numerous photo opportunities in good viz. As for the BlueFlash wreck diving regulars, well we have a brand new sonar fitted to our boat and with so many wrecks around the Cape coast still to be found I’m hoping to discover many more.